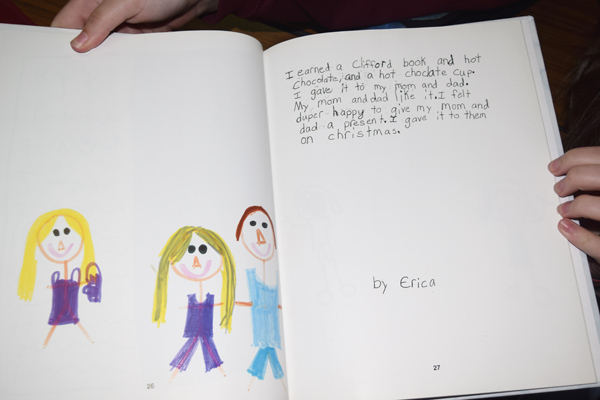 Photo: Erica used The Shadow Project in elementary school to earn Shadow Bucks and buy gifts. Erica, 14, has a learning disability that made spelling and reading difficult, and she used to get frustrated when she couldn’t do her work. But thanks to The Shadow Project, the McMinnville eighth grader has learned to set small, achievable goals and can now read at grade level. Erica has been in The Shadow Project for six years, with a lot of reading and writing help from special education teacher Jolene Heinrich, M.S. When she achieves the goals she sets for herself, she earns Shadow Bucks to “buy” books and gifts for her mom, dad, little brother, and newborn niece. Said Jolene: “Erica has matured a lot. When she began The Shadow Project, she was reading two grade levels behind. Now she reads at grade level. She is an advocate for herself and knows when to ask for help, not just in reading, but in writing and math.